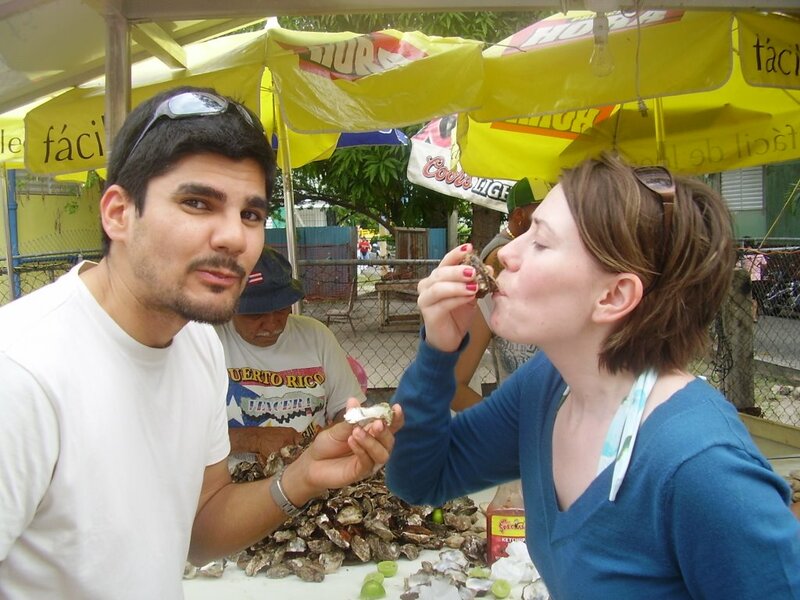 This is Gustavo and me in Puerto Rico over Christmas. I am eating oysters for the first time ever. Closing my eyes seemed appropriate in preparation for the rumored sliminess I had been afraid of all my life. The first one I sucked into my mouth, and I said "Do I chew it or just swallow it?" I should have had instructions first. I always heard that you just swallow them, so the first one I swallowed. I didn't really see the point of eating something that I didn't even taste. So the next many, many that I ate, I chewed. I was completely entranced by the freshness of the oyster combined with the saltiness of the ocean and tartness of the lime. If the ocean could itself could be served, it would taste like this. hihi! Sorry, i couldnt find your email address so am leaving a note here about possibly starting another link partnership with my handbag blog? Check it out (in my profile since i dont want to spam your comments page). Let me know! PS- i am now craving shucked oysters! mmmmmmm!